Japanese manga has developed its own visual language or iconography for expressing emotion and other internal character states. This drawing style has also migrated into anime, as many manga stories are adapted into television shows and films. While this article addresses styles from both types of output, the emphasis here is on the manga origins for these styles. The popular and recognizable style of manga is very distinctive. Emphasis is often placed on line over form, and the storytelling and panel placement differ from those in American comics. Impressionistic backgrounds are very common, as are sequences in which the panel shows details of the setting rather than the characters. Panels and pages are typically read from right to left, consistent with traditional Japanese writing. Because manga is a diverse art form, however, not all manga artists adhere to the conventions most popularized in the West through series such as Akira, Sailor Moon, Dragon Ball, and Ranma ½.
Screentone: Transparent adhesive sheets manufactured with a distinctive pattern (typically, some form of dots or hatching, but also including a variety of flashy effects like stars or explosions, or commonplace scenes such as cityscapes, schoolyards, and natural landscapes), these are cut out and overlapped on the panel to introduce shading and detail that would be time-consuming or unfeasible to draw by hand. Increasingly, physical tone sheets are being replaced by computer-generated equivalents. Expressive dialogue bubbles: The borders of the speech/thought bubbles change in pattern/style to reflect the tone and mood of the dialogue. For example, an explosion-shaped bubble for an angry exclamation. Also, manga does not usually follow the normal Western comic conventions for speech (solid arc extending from the character's head) and thought bubble (several small circles used in place of the arc). The latter bubble style is often used for whispered dialogue in manga, which can confuse Western readers. Speed lines: Often in action sequences, the background will possess an overlay of neatly ruled lines to portray direction of movements. Speed lines can also be applied to characters as a way to emphasise the motion of their bodies (limbs in particular). This style, especially background blurs, extends into most action based anime as well. Mini flashbacks: Many artists employ copies of segments from earlier chapters (sometimes only a single panel) and edit them into the story panels to act as a flashback (also applying an overlay of darker tone to differentiate it from current events). This can be considered a convenient method to evoke prior event(s) along with visual imagery. In situations where a character's life events flash across his/her mind, a splash page may be used with the entire background consisting of segments from earlier chapters. Abstract background effects: These involve elaborate hatching patterns in the background and serve to indicate or strengthen the mood of the plot. It can also illustrate a character's state of mind. While the art can be incredibly realistic or cartoonish, characters often have large eyes (female characters usually have larger eyes than male characters), small noses, tiny mouths, and flat faces. Psychological and social research on facial attractiveness has pointed out that the presence of childlike facial features increases attractiveness. Manga artists often play on this to increase the appeal of protagonists. Large eyes have become a permanent fixture in manga and anime since the 1960s when Osamu Tezuka was inspired by Disney cartoons from the United States and started drawing them in this way. Furthermore, inside the big eyes, the transparent feeling of pupils and the glares, or small reflections in the corners of the eyes are often exaggerated, regardless of surrounding lighting, although they are only present in living characters: the eyes of characters who have died are the colour of the iris, but darker. Sometimes this death effect is also used to indicate characters who are emotionless due to trauma or loss of conscious control because of possession (ghost, demon, zombie, magic, etc.). In characters with hair partially covering the face, the eyes that would otherwise be covered are often outlined to make them visible, even when the hair is particularly dense and dark. Eye shape and size can be exaggerated or changed altogether. Love-hearts and doe-eyes indicate an infatuation, while stars indicate that the character is star-struck. Spirals indicate confusion or dizziness, while flames or wide empty semicircles indicate that the character is angry or vengeful. When dead, unconscious or stunned, "X"s are sometimes used as an indication of the state. Eyes may be replaced with two "<"s facing in opposite directions to represent a variety of emotions, such as nervousness or excitement. Eyes without pupils and with reflective glints indicate a state of delirium. Enlargement of the eyes, where they become huge and perfectly round with tiny pupils and no iris and going beyond the reach of the face (often shown with the mouth becoming like a stretched semicircle, the point of which extends past the chin) symbolises extreme excitement. Similarly, turning eyes into two thick half-circles, conveys a cute, delighted look (see Character design section below). 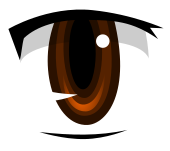 The character's eye shapes and sizes are sometimes symbolically used to represent the character. For instance, bigger eyes will usually symbolize beauty, innocence, or purity, while smaller, more narrow eyes typically represent coldness and/or evil. Completely blackened eyes (shadowed) indicates a vengeful personality or underlying deep anger. It could also indicate that someone's being a wise-guy type, particularly when accompanied by grinning. A character's eyes are shadowed regardless of the lighting in the room when they become angry, upset, something is wrong with them, or they are emotionally hurt. Bubbles forming in the corner of a child's or female character's eyes often indicate that the character is about to cry. Mouths are often depicted as small, usually rendered with one line on the face. A fang peeking from the corner of the mouth indicates mischief or feistiness (unless, of course, the character has fangs normally). A cat mouth (like a number "3" rotated 90° clockwise) replacing the character's normal mouth, and usually accompanied by larger eyes may also represent mischief or feistiness (a notable exception being Konata Izumi from Lucky Star, whose usual mouth shape is this). Again, noses are often depicted as small, with only a brief L-shaped mark to locate them. With female characters, the nose can sometimes be removed completely when the character is facing forward. In profile, female noses are often button shaped, consisting little more than a small triangle. A nosebleed indicates sexual excitation following exposure to stimulating imagery or situation. It is based on a Japanese old wives' tale. A balloon dangling from one nostril (a "snot bubble") indicates sleep. Sweat drops are a common visual convention. Characters are drawn with one or more prominent beads of sweat on their brow or forehead (or floating above the hair on characters whose back is turned). This represents a broad spectrum of emotions, including embarrassment, exasperation, confusion, and shock, not all of which are necessarily considered to be sweat-inducing under normal conditions. Actual physical perspiration in manga is signified by even distribution of sweat drops over the body, occasionally on top of clothing or hair. Throbbing "cross popping" veins, usually depicted as a cruciform or triskelion in the upper head region, indicate anger or irritation. These shapes can sometimes be exaggerated, and placed on top of hair when the character is facing away from the viewer. Further throbs indicate additional anger. 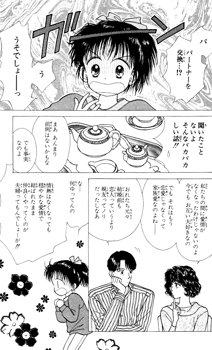 However, some manga such as Doraemon use smoke puffs to represent anger, and does not have the vein insignia. A red cheek or hatchings on the cheek represent blushing, usually used when embarrassed by romantic feelings, while oval "blush dots" on the cheeks represent rosy cheeks. This can sometimes be confused with a scribble on the cheek, indicating injury. Sometimes when the character is expressing strong emotions, such as sadness, a long blush through the nose would appear. Facial shape changes depending on the character's mood, and can look from round apple-shaped to a more subtle carrot shape. Parallel vertical lines with dark shading over the head or under the eye may represent mortification, fatigue, or horror. If the lines are wavy, they may represent disgust. A far cuter way to represent frustration/mortification is (mainly for female/young female characters) that they tend to puff out their cheeks while their line is delivered in a gruff voice, an elongated "3" showing puffed lips, to emphasize that puffed look. Hair colors of anime characters are not just selected randomly. In some cases they express significant elements of that person's character (based on color symbolism in Japan). Blue: Peace, calm, stability, dependability, male, cold, loyalty. With dependability, dark blue means more responsible than light blue. To better elicit a more emotional response with the audience for a certain character, a manga artist or animator will sometimes use certain traits in the character's design. The most common features include youthfulness as a physical trait (younger age or pigtails) or as an emotional trait such as a naive or innocent outlook, a childlike personality, or some obvious sympathetic weakness the character works hard to correct (extreme clumsiness or a life-threatening disease) but never really succeeds to get rid of. A round swelling, sometimes drawn to the size of baseballs, is a visual exaggeration of swelling from injury. Thick black lines around the character may indicate trembling due to anger, shock or astonishment. This is usually accompanied by a rigid pose or super deformed styling. Sparks literally fly between the eyes of two characters when they are fighting, or simply glaring at each other (in this case, their eyes may also be connected by a lightning streak). A character suddenly falling onto the floor, usually with one or more extremities twisted above himself or herself, is a typically humorous reaction to something unexpected happening. All facial features shrinking, the nose disappearing, the character sometimes lifting off the floor and the limbs being multiplied as if moving very fast symbolizes panic; if the same but with larger facial features it symbolizes comic rage or shock. Some may come with a yellow spark like symbol near their head. Exaggerated facial features signify anger. Examples such as star-like eyes with dark shading surrounding them while the face is framed by a red and black background imply comedic and/or understated rage. Others may include white circular eyes with slanted eyebrows and a square jaw with sharp teeth or even burning eyes with gritted teeth. Tear drops everywhere or forming a twin fountain indicate either intense joy or sadness. An ellipsis appearing over a character's head indicates a silence, implying that something is going unsaid. A drooping head may indicate sorrow or depression. Some may come with lines drawn of the hunched character or over their eyes. Variations with wavy lines and white circular eyes can imply embarrassment. More often than not, character colorisations tend to represent the character in some way. A more subdued character will be coloured with lighter tones, while a flamboyant character will be done in bright tones. Similarly, villains are often coloured in darker tones, while colder characters will be given neutral tones (black, white, grey, etc.). Characters push their index fingers together when admitting a secret or telling the truth to another. An odd white shape (more often than not, something close to a mushroom) that appears during an exhale represents a sigh of awkward relief or depression. A wavy ghost coming out of the mouth is often a comical representation of depression, mortification, or a comedic and figurative death. This is a reference to the hitodama, as is the above example. Cherry blossoms indicate a sweet or beautiful moment. This is a reference to Mono no aware. A flower blossom falling off its stem may indicate death or, more commonly, loss of virginity. Unbound hair may represent freedom, while hair that is tied back may represent some form of either literal, figurative or emotional enslavement of some kind. Sleeping people may be indicated by having a bubble coming out of the nose, said bubble inflating and deflating as they snore. This is usually done when the character sleeps at an inappropriate moment (e.g. during class, at work, outside, in public, in an unusual pose or location, etc.). Sometimes, when a character screams or is surprised, they will do The Scream pose. Twitching eyebrows or eyelids may indicate anger or shock that the character is holding back. Negative imagery or rapidly dilating eyes often indicates either severe shock or a severe psychological effect. The image of something cracking or shattering often signifies either death or a serious event. Dark shading over the eyes or the eyes' omission while showing the face often suggest a silent or sullen disposition. Twinkling or star-like eyes with a smile often signify excitement while heart-shaped eyes imply immediate attraction to someone or something. A serious bloody nose (often mimicking a waterfall) often indicates a romantic or infatuated reaction from male characters. A character with white eyes, a stern look, and a dark atmosphere around them can imply barely concealed rage at someone or something. Suddenly changing the character's eyes into Valentine hearts can also indicate that they are madly in love with another character. Smoke or steam coming out of the character's nose indicates that the character is aroused. When one character sharply criticized or brings up a topic that is quite sensitive to another character, the impact of their words are sometimes symbolically shown by having their word bubble form an arrow that metaphorically pierces the other person they are talking to. ^ "Babyfaceness". www.beautycheck.de and Universität Regensburg. 2002-07-15. Retrieved 2008-10-15. ^ Van Huffel, Peter. "Tanioka Yasuji". Retrieved 2008-09-17. ^ "Cross-Popping Veins". TV Tropes. Retrieved 2015-06-19. ^ a b Norimi, Morisaki (October 2005). "How To Draw Manga: Lesson Three". Shojo Beat. 1 (4): 258.